The only son of Frandar Hunding, born in Yokuda late in his life by an unknown woman. Although the son of a famous Ansei, Divad rejected the Way of the Sword from early on, leaving his training at age 16 to take the life of a bard instead. He traveled widely for several years, gaining a great deal of fame and recognition for his singing. Although he officially forsook the sword, it was rumored that he continued to practice the Way known as Shehai Shen She Ru -- the Way of the Spirit Sword. When Emperor Hira began to persecute the sword-singers, Divad was first on his list due to his fame. The emperor sent 100 of his best guards to arrest him, and they arrived while Divad was eating with his elderly mother. They successfully arrested him and had him in chains when one of the guards cruelly struck his mother, killing her. That instant, the spirit of the Way awoke in Divad, and he turned his own chains into weapons, slaying four guards and escaping out of the window. He became a prominent figure in the resistance against Hira, rumored to appear everywhere the emperor's plans went awry. He approached his father as well, and ultimately convinced him to lead the war against the emperor, with Divad as an advisor and soldier. Divad and Frandar later took part in the great Ra Gada migration to mainland Hammerfell. With his band of Sword-Singers, he forged and wielded five mighty Shehai to defeat the goblinkin occupying the land and make it safe for settlement. 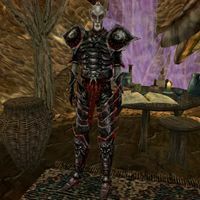 For these accomplishments, Divad is considered one of the great heroes of Redguard legend, yet in the epic poem Divad's Chagrin, it is said that he deeply regretted having to leave behind his music and turn to war. Divayth Fyr was a Dunmer sorcerer born as a Chimer in Tel Aruhn in the early First Era who lived until at least the end of the Third Era, at the age of 4000, and who may still be alive today. He is a member of Great House Telvanni, though he generally stayed out of House politics. 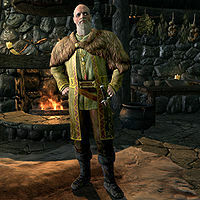 In the Third Era, Fyr lived in his tower of Tel Fyr in the Azura's Coast region of Vvardenfell along with his four "daughters" (female clones of himself), Alfe, Beyte, Delte and Uupse Fyr. Dragonne Papre was an enormous dragon who lived in the Battlespire during the Third Era. He was the companion of an Imperial Battlemage named Samar Starlover. His lair was located in the bowels of the Battlespire. 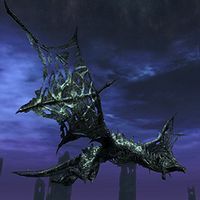 When the invading daedric armies of Mehrunes Dagon began to overwhelm the Battlespire during the Imperial Simulacrum, Samar told the surviving Battlemages of his plan to mount Papre and fly to the Imperial Palace on Mundus in order to notify Emperor Uriel Septim VII (although, at the time, Jagar Tharn was impersonating the Emperor and was perfectly aware of the invasion). However, the daedra had prevented Papre from escaping by sealing the main gate, and presumably killed him. When Starlover fought his way to Papre's lair, all he found was a carcass. Unable to request a rescue force, Starlover gave up hope and took comfort in being "eternally reunited" with his companion in death. The Battlespire fell to the daedra, who then retreated back into Oblivion. Starlover's log was later discovered beside Papre's skeleton by a Battlemage apprentice, who single-handedly followed the retreating armies into Oblivion and banished Dagon in his own realm. The logs were returned to Tamriel and came into the possession of Divayth Fyr. Due to the nature of dragons, Dragonne Papre isn't truly dead and could be raised again; however, it is doubtful that his remains survived the destruction of the Battlespire. A Reachman leader during the chaotic Interregnum period. At some point he raised an army from the Reach and seized control of the Empire of Cyrodiil, reigning as the first of the Longhouse Emperors. Durcorach married Veraxia Tharn of the prominent Nibenese Tharn family, allegedly to legitimize his claim to the Ruby Throne. In 2E 541, Durcorach led the Reachmen in a bloody invasion of High Rock, ravaging the countryside and pillaging many cities. After abandoning a lengthy siege of Wayrest in 2E 542, he set his sights towards Daggerfall. As his forces massed before the gates, Emeric of Cumberland led a daring maneuver that completely flanked Durcorach's ranks, taking them by surprise. The defenders of Daggerfall sallied forth for a devastating pincer attack, during which the Black Drake himself was struck down by Emeric and his forces scattered. In 4E 201, the Last Dragonborn and Serana journeyed to the Soul Cairn in search of Valerica. Their actions awoke Durnehviir, who attacked the intruders. He was killed by the Dragonborn, but his soul was not devoured thanks to the Ideal Masters' protection. He promptly rematerialized, and hailed the Dragonborn as his "Qahnaarin", or Vanquisher. Humbled by his defeat, Durnehviir allied himself with the Dragonborn. He asked the Dragonborn to use the thu'um to summon him to Tamriel, allowing him to briefly be free of the Soul Cairn. In return for granting his wish, Durnehviir fought for the Dragonborn and passed on the knowledge of a necromantic Dragon Shout. Although Durnehviir's debt to the Ideal Masters had been paid, he remained eternally trapped in the Soul Cairn. These [records] may help explain why so much of Aldmeri literature is forbidden, scorned, or untranslated, for I have seen [their] like before. The Direnni were either exceedingly paranoid or their system of economy so inextricably linked with dangerous theosophist numeral-symbolism that much of what is recorded here requires ... sorcerous precautions on the part of the reader. [Hidden magic] is everywhere incorporated in their writings...signs and preternatural runes and [correspondences]... in expenditure columns, even, or margins [that] can be fatal to the uninitiated. Crucial pages were covered in spittle of the previous translator, who had babbled idiotically over the text for days before catching fire. Esta página foi modificada pela última vez à(s) 11h39min de 22 de setembro de 2015.